Footsteps of Spring. Unless otherwise captioned, all images are by Maureen Eppstein. 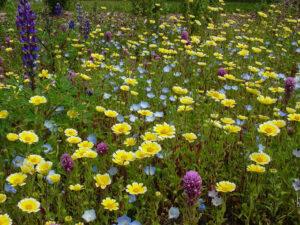 A field of mixed wildflowers: Arroyo Lupine, Baby Blue-eyes, Purple Owls Clover and Tidy-tips. Image from Mother Nature’s Backyard. [After a visit to the Lick Observatory on Mt. Hamilton] We decided to see what it was like on the other side of the mountain. We found ourselves in a charming little valley, the San Antonio, which we followed back to Livermore and the freeway home. The land in this part is lightly wooded, and very sparsely populated—we saw a few ranch houses, occasional small herds of cattle, the odd horseman and dog, and that’s all. And at this time of year, the earth between the trees is covered with fresh grass, so scattered and strewn with wildflowers that it looks like some magic carpet. I think it is one of the most wonderful sights I have ever seen. Great swathes of colour, of every shade. 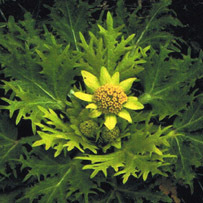 One they call Sunshine, or Goldfields, a tiny daisy-like flower, brilliant yellow. It grows only a few inches high, but in such profusion that, as its name implies, it makes a great field of colour. And on the slopes of Mt. Hamilton we thought for a while the snow was still lying, there were such patches of a snowy white flower. But other colours too, pinks and blues right through to the purples and reds. And down in the lower valleys, the California poppy, a brilliant orange. …I love these flowers so much. the way we learn to belong. In a couple of days I’m off to Portland, OR for the Associated Writing Programs (AWP) conference. 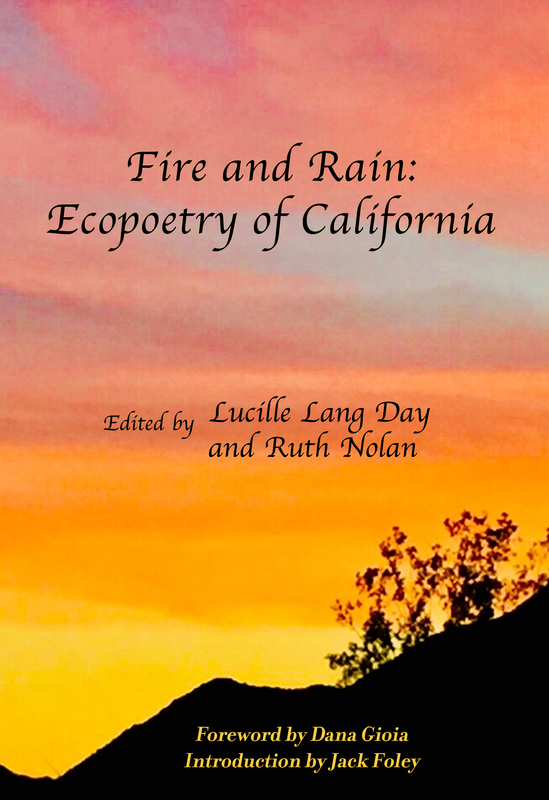 I was invited to be part of a group representing Scarlet Tanager Books, publisher of the anthology Fire & Rain: Ecopoetry of California, in which I have several poems. We’re hosting a reception at the conference, and doing a reading at a neighboring bookstore. Being recognized as an “ecopoet of California” makes me feel that, after what is now 52 years, this beautiful state is home. Enjoy this season’s flowers. We went blackberrying on St. Ann’s Hill, not far from here. Got a lovely lot—have been busy making jelly, pies, etc. David had a wonderful time—it was so sweet to see the solemn single-mindedness with which he set about collecting his berries—and he didn’t eat a single one until Tony offered him a handful—to comfort him when he tumbled down a slope into a patch of brambles. Modern American parents would probably be horrified at how lackadaisical we young mothers in England were about supervising our children’s play. Once the daddies were gone to work, our little close of twenty-eight row houses was almost completely free of traffic. The kids, twenty of them under school age, ran in and out of each others’ houses and romped together across the grassy front yards. The Monday after our blackberrying expedition, I went out to gather up two-year-old David for lunch. I found him and his little friend in a still-rough corner between the housing blocks. His mouth was stained red. 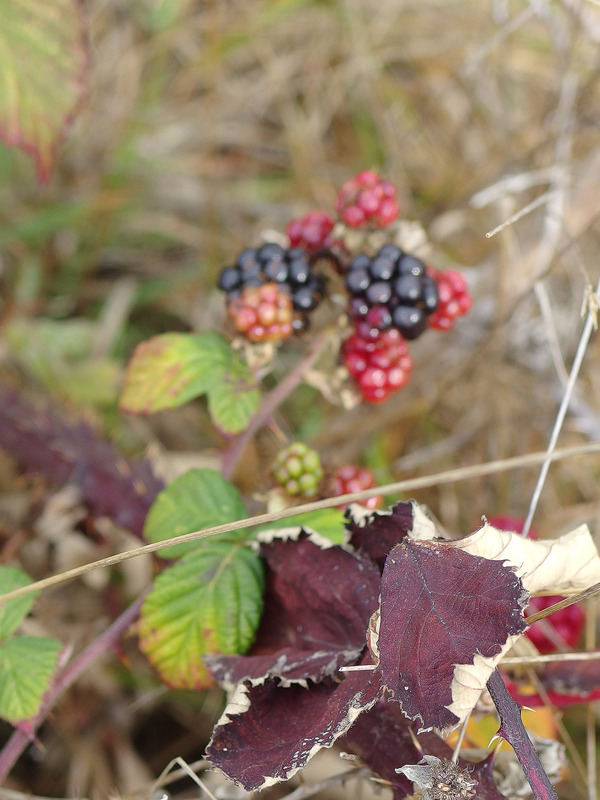 “I picking blackberries, Mummy,” he announced cheerfully. 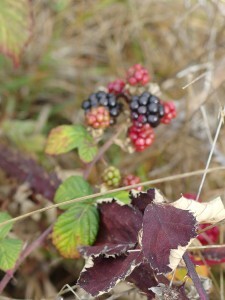 I took one look at the berry-laden plant, then rushed back to the house. 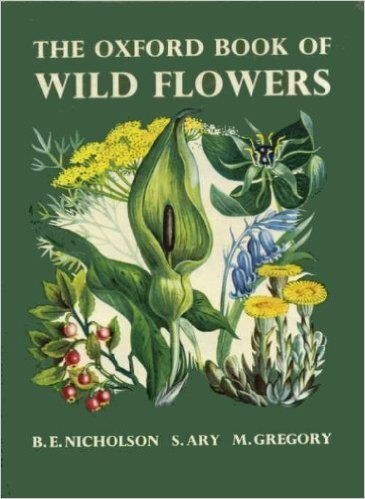 My Oxford Book of Wild Flowers confirmed my guess: Deadly Nightshade. 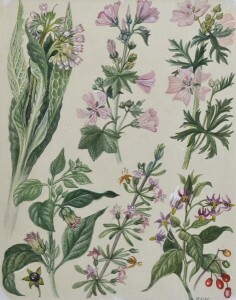 Watercolor illustration by Barbara Nicholson in The Oxford Book of Wildflowers, Oxford University Press, 1960. Shown are: Comfrey, Common Mallow, Musk Mallow, Deadly Nightshade, Duke Of Argyll’s Tea Plant, and Woody Nightshade. The police organised all the rest of the kids in the close whose parents couldn’t prove they were somewhere else that morning into another convoy of ambulances for a mass stomach pumping session. About a dozen altogether involved, of which four (including David) were confirmed cases, though they decided to keep the whole lot overnight for observation, just in case. Meanwhile the newspapers had got hold of the story. We refused to see them at the hospital, but when we got home about 7:00—completely exhausted, & having had nothing to eat since breakfast—we were invaded by a posse of reporters. A highly garbled & exaggerated account appeared the next day. I suppose it’s not every day one makes the front page of the Daily Mail, the Daily Mirror, & the BBC News, but I shouldn’t care for the honour to happen again. Anyway, the story ended well—all the kids were discharged the next morning, with none but the hospital staff any the worse for wear—in fact the sister-in-charge of the children’s ward where the confirmed cases were confessed that she hadn’t known that four such tiny boys could get so involved in riots and punch-ups all up and down the ward, and they were very pleased to see the back of them. 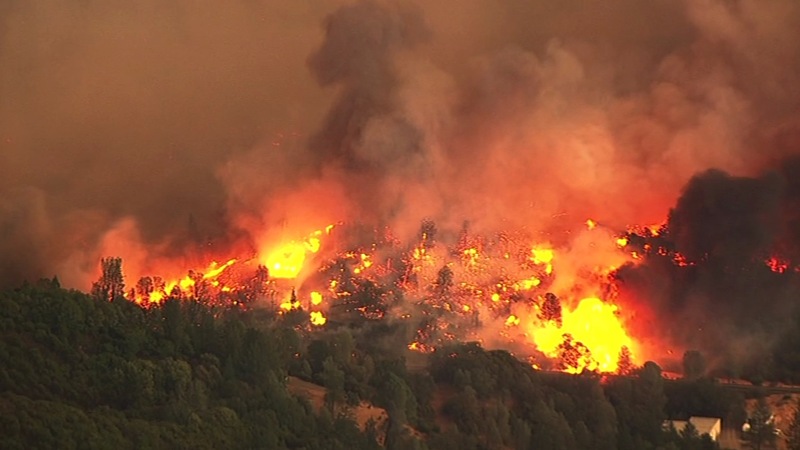 In neighboring Lake County this past summer, wildfire destroyed 76,000 acres of forest (about seven million trees) and nearly 2000 homes, businesses and other structures. Mendocino Coast Botanical Gardens has stepped up with their Lake County Giving Project. One component of the project encouraged people to purchase potted trees and other plants for their holiday decorations, then bring them back to be donated to Lake County residents rebuilding their homes. 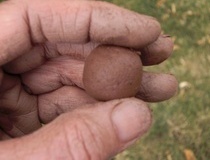 A Wild Jules seed ball. The balls being prepared for Lake County habitat restoration are a little more flattened so that they stay put on steep hillsides. Tony and I were intrigued enough to stop by the Garden Store to donate a few dollars to the seed ball purchase fund. In this unseasonably gorgeous January weather, I started thinking about wildflowers. This morning I took a walk at Glass Beach to look for Blennosperma. Sure enough, they’re up. 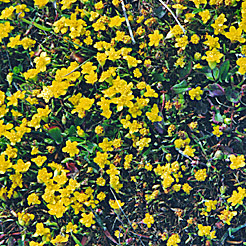 Not yet the carpet of gold, but a few bright yellow stars dot the green of our coastal prairie, the uplifted strip of land at the edge of the cliffs. Like many of the California wildflowers we amateur flower seekers call “little yellow jobs,” the Blennosperma flower is daisy-like and shiny. 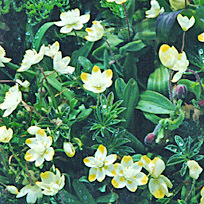 Our variety, Blennosperma nanum var. 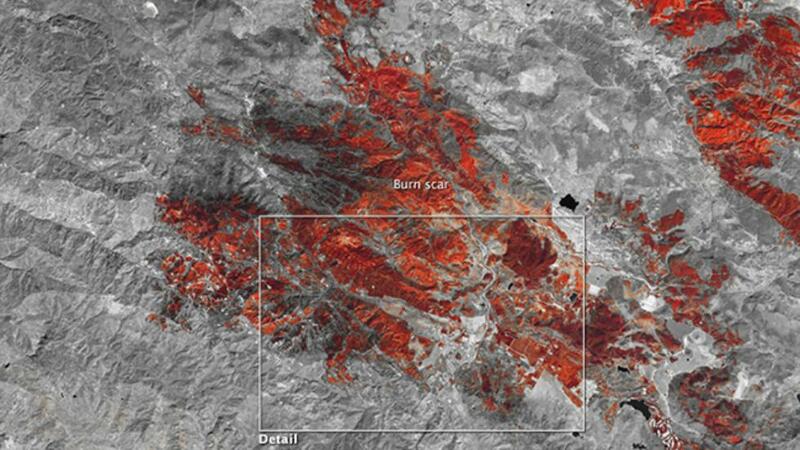 robustum, is on the Endangered Species list. It grows only on the Glass Beach Headlands and at Point Reyes. Glass Beach, now part of MacKerricher State Park, is a popular place to walk. There is talk of putting a cycling trail through it. Seeing those early flowers, I realize again that we’re in danger of loving this place to death. I try to be careful where I walk. It is one thing to know as a fact that high rainfall tallies in California’s rainy season result in more spring wildflowers. It is quite another thing to feel with your whole being that exuberant burst of fecundity. At MacKerricher State Park this morning the air is misty and the sea is calm. Out by Laguna Point, swathes of Goldfields (Lasthenia chrysotoma) dazzle the eye. Up close, I see that among the Goldfields are patches of Purple Butter & Eggs (Triphysaria eriantha ssp. rosea) whose complementary color makes the gold even more eye-popping. Scattered among them are California Poppies (Eschscholzia californica). 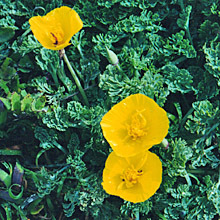 Not the orange poppies we coast dwellers snobbishly refer to as freeway poppies, but our own coastal variety, the leaves more fleshy to resist the salt wind, the flowers a prettier yellow. South along the headlands trail, I know a place where Coast Delphinium (Delphinium decorum) grows. Never more than a foot high, each plant has a head of deep blue flowers that glow with intensity. This year they are magnificent. As I crouch to admire, I remember renewing their acquaintance in previous springs. This is the way an immigrant learns to belong: to come back and back to a place, to remember its varied moods, to remember where the flowers are. Here on the Mendocino Coast, where winters are mild and rainy, now is the time to look for the first wildflower, Scoliopus bigelovii, commonly known as Slink Pod. The shady bank down by our creek, where I usually see them, was littered today with debris where the top of an old fir had fallen, but there was still one plant unsmushed by the crash, a new bud opening, and spent flower heads already slinking off to find new earth for their seeds.